Friday, the state of Norway saw two national tragedies occur. The first of which was a bombing in Oslo, Norway. The explosions were right in the middle of the town and a minimum of seven people died in the bombings. The shooting took place in a youth camp. The camp is run by the Labour Party of Norway, which is the current ruling party in the state. In the youth camp, a man wearing a police uniform let off a barrage of gunshots into a crowd of approximately seven hundred people. One person was arrested as a result. Prime Minister Jens Stoltenberg’s office building was hit in the blast, which leads officials to speculate that the two incidents are connected. Stoltenberg was not in the office when the blast occurred. [readnext]In the bombing, no one has been singled out as the culprit as of yet. 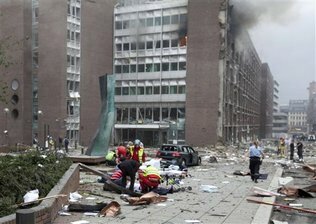 The blasts damaged the government buildings and injured numerous civilians in Oslo. The state of Norway is rarely the site for such criminal activity. While there is no evidence that the bombing was a terrorist attack, based on the recent reports of al Qaeda planning attacks throughout Europe, it is not a far cry to assume that this was an act of terrorism. As the injured are being treated at local hospitals and the damage is being assessed, the panic level in Norway is high as it is probable that the state has just suffered a terrorist attack. So sad! Terrorism has to end!